Liversedge’s battling team of giants earned what could be a valuable point as they aim to kick-start their escape from relegation from the NCEL Premier Division. The West Yorkshire side, who began the game six points adrift at the foot of the table, after being unable to play a home game for four months. They didn’t look like a side without an away win all season, and could have ended that run with a bit more composure in front of goal. Brice Tiani had already missed a glorious chance by the time the visitors took the lead. Tiani’s side-footed volley from six yards out went wide, but striker Anthony Hilton showed him how it was done on 11 minutes. Josh Heseltine was robbed of possession in his own half and the ball eventually found Hilton who lobbed keeper James Hitchcock. Town got themselves level just before the half-hour mark. Andy Norfolk was sent clear and although his effort was parried by Christian Thewlis, Chris Adams did well to beat the defender on the line with the rebound. Bridlington Town scorer Chris Adams battles with Kevy Tazangadza. The linesman’s flag went up, but referee Darren Whatling overruled him and the goal stood. Bridlington manager Gary Allanson felt it was a case of two points dropped for his title winning side. 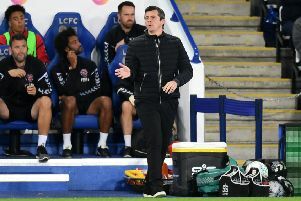 He said: “Obviously the pitch isn’t at its best at the moment, but they were a team of giants, big, strong and physical and a completely different team from when we played them at their place. “They are fighting for their lives and they intimidated us with their physical presence, we tried to pass the ball and create things but they were difficult to break down and put their bodies on the line. After Town’s equaliser, Hitchock made a fine save at the feet of Benny Igiehon, before diving full-length to deny Max Elliott and scrambled the resulting corner away from under the crossbar. His opposite number Thewlis comfortably saved efforts by Tim Taylor and Norfolk, as the sides went in level at the break. Clear-cut chances were a rarity in the second half. Alex Knaggs and Benny Igiehon. Adams’ weak finish from Joel Sutton’s deep cross was blocked and substitute Ryan Nicholls had to make a last-ditch tackle after Brandon Kane bulldozed his way through the centre of Town’s defence. Kane muscled his way towards goal again and found himself one-on-one with Hitchcock, but his lob dropped the wrong side of the post. That was their best chance of the second half and afterwards, it was Bridlington who looked likeliest to find a winner. Norfolk turned neatly after a lovely team passing move but fired over the bar, and Sutton couldn’t keep his attempt down when he met Benn Lewis’ low cross. Allanson felt his side were showing signs of fatigue by the end of the 90 minutes. “We can coach technique and tactics and change formations but players need to have big hearts and have a bit of passion and desire and I think we lacked some on Saturday, but that comes from within, we can’t coach that. “That was our third game in a week and I would say we have been out-fought in all three. Maybe the season has finally caught up with us, we looked tired.